It's a common joke among women juggling work and family. But it's not actually a joke. Having a spouse who takes care of things at home is a Godsend on the domestic front. It's a potent economic asset on the work front. And it's an advantage enjoyed - even in our modern society - by vastly more men than women. Working women are in an advanced, sustained, and chronically under-reported state of wife drought, and there is no sign of rain. But why is the work-and-family debate always about women? Why don't men get the same flexibility that women do? In our fixation on the barriers that face women on the way into the workplace, do we forget about the barriers that - for men - still block the exits? 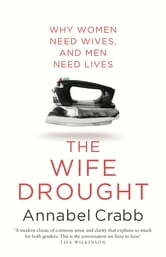 The Wife Drought is about women, men, family and work. Written in Annabel Crabb's inimitable style, it's full of candid and funny stories from the author's work in and around politics and the media, historical nuggets about the role of 'The Wife' in Australia, and intriguing research about the attitudes that pulse beneath the surface of egalitarian Australia. Crabb's call is for a ceasefire in the gender wars. Rather than a shout of rage, The Wife Drought is the thoughtful, engaging catalyst for a conversation that's long overdue. Loved it. Who said a well researched book cannot also be funny. Well done. A "must read" for any Australian woman with a job and a sense of humour. The Wife Drought serves up some of the realities of working families with wit and charm.